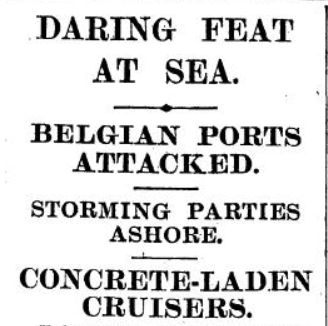 On 23rd April 1918, Zeebrugge and Ostende were attacked by British forces to stop German access to the sea. 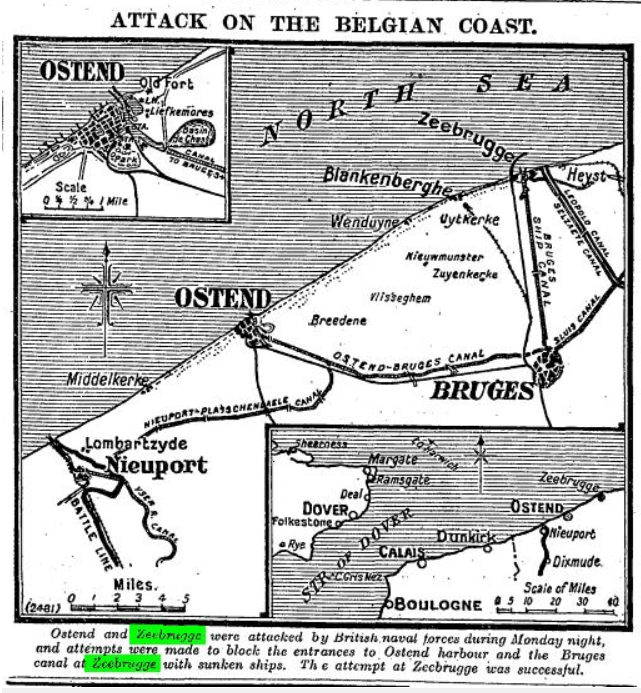 Both ports were linked by a series of canals to the inland port of Bruges and blocking them would provide safe passage for Allied merchant shipping. Anti-submarine measures were a priority for the British, as merchant shipping was at crisis point as so many ships were being lost to U-boat attacks. 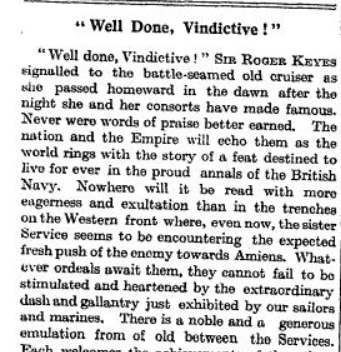 The aim was to sink three old Royal Navy vessels, IPHIGENIA, INTREPID and THETIS, which had been filled with concrete as blockships, at the entrance of Zeebrugge harbour to stop German submarines from accessing the English Channel. Two other blockships SIRIUS and BRILLIANT went to Ostende. To get the ships into position, marines were to land from VINDICTIVE at night to storm the heavily fortified Mole, to prevent German attack on the three ships to be scuttled. Two explosive filled submarines were to destroy the viaduct which connected the Mole to the shore. It was a highly dangerous mission, and chances of survival were so slim that the raiding teams were made up of volunteers. The attack on the Mole failed as marines were mown down by gunfire. Only two of the blockships were sunk in the canal and only one submarine full of explosives made it to the viaduct. Disappointingly despite the raids, the Germans were able to pass the blockships at high tide. From over 200 British deaths and 600 casualties, at least nine of the men killed were Irishmen. Private HENRY CONKEY CAMPBELL, RMLI, from Foundry Street in Belfast. Buried in Dover. Age 19. Private HUGH O’NEIL, RM, from Trillick, County Tyrone. Buried in Dover. Age 26. Private DAVID O’SULLIVAN, RMLI, from Tallow, County Cork. Buried in The Netherlands. Age 20. Private DAVID SNEYD, RMLI, from Dublin. Buried in Belgium. Age 25. Able Seaman JOHN CAINE, RN, from Middleton, County Cork. Buried in Dover. Age 22. Petty Officer MICHAEL DANIEL HALLIHAN, RN, from Castlehaven, County Cork. Buried in Dover. Age 28. Able Seaman JOHN HANNAN, RN, from Ladysbridge, County Cork. Buried in Kent. Age 32. Able Seaman GEORGE LYONS, RN, from Cork. Buried in Dover. Age 33. Able Seaman THOMAS GEORGE MCSHANE, from Lambeg, Lisburn, County Down. Buried in Dover. Age 24. Remembered. May they rest in peace.